A painting by Robert W. Weir (1803–1890) showing Protestant pilgrims on the deck of the ship Speedwell before their departure for the New World from Delft Haven, Holland, on July 22, 1620. William Brewster, holding the Bible, and pastor John Robinson lead Governor Carver, William Bradford, Miles Standish, and their families in prayer. The prominence of women and children suggests the importance of the family in the community. At the left side of the painting is a rainbow, which symbolizes hope and divine protection. The Pilgrim Fathers is the common name for a group of English separatists who fled an environment of religious intolerance in Protestant England during the reign of James I to establish the second English colony in the New World. Unlike the colonists who settled Jamestown as a commercial venture of the joint-stock Virginia Company in 1607, the Pilgrims migrated primarily to establish a community where they could practice their religion freely while maintaining their English identity. Worshiping in various separatist churches in London, Norfolk and the East Midlands, the future pilgrims fled to religiously liberal Holland from 1593. Concerned with losing their cultural identity, the group arranged with English investors to establish a new colony in North America and made the dangerous Atlantic crossing on the Mayflower in 1620. The founding of the Plymouth Colony in Massachusetts and its historic charter, the Mayflower Compact, established early precedents for autonomous self rule and the belief that political and civil rights were God-given. The Compact promised "all due submission and obedience [to such] just and equal laws" that the fledgling community might pass and, according to Samuel Eliot Morrison, was "a startling revelation of the capacity of Englishmen in that era for self-government." The Plymouth colony's relations with Native Americans were largely peaceful, despite profound cultural misunderstandings. The devout Christian settlers not only won the sincere friendship of Indian leaders, they "set a model for interracial diplomacy that was followed, with varying success, by later Puritan colonies," according to New England colonial historian Alden Vaughn. "Justice, tolerance, decisiveness, and amity became the keystones of Plymouth's Indian policy." Relations deteriorated with the passing of the first generation and the expansion of English settlement in New England, culminating in the regional King Phillip's War (1675), a watershed event that permanently altered the balance of power in favor of the numerically and technologically superior English colonists. The Pilgrims' epic voyage, perseverance amid crushing hardships, and settlement in the New England wilderness, have come to be regarded as part of the narrative describing the birth of the United States. The Pilgrims' motivation of risking everything for the freedom to worship according to their conscience set a precedent that would come to be enshrined in the First Amendment of the U.S. Constitution guaranteeing the free exercise of religion. In 1586 a group of religious dissenters were sent to the Clink, the prison in the London Borough of Southwark used for the detention of heretics, for refusing to obey the religious laws of the realm. Elizabeth I was trying to chart a middle course between Roman Catholicism, which until recently had been the religion of England and was still close to the lives of her people, and the Reformed Church, which had broken with Rome during the reign of Elizabeth's father, Henry VIII. The Elizabethan religious settlement had tried not to unnecessarily offend the Catholic sentiments of many Englishmen whose loyalty was necessary, while effectively restoring the Reformed Church after the interregnum of the Catholic Queen ("Bloody") Mary. English Puritans, influenced by the more radical reform movement on the Continent, specifically by Calvinist doctrine, deplored the compromise and sought to abolish the episcopate, clerical vestments, and any authorized books of prayer. Radical Puritans went further, finding accommodation impossible and "separating" into unauthorized congregations to worship according to the dictates of conscience. Separatists were cruelly persecuted under Mary, and enjoyed little tolerance under Elizabeth. The penalties for conducting "seditious" unofficial services included imprisonment, large fines, and execution. The London dissenters in the Clink nevertheless founded a church under the guidance of John Greenwood, a clergyman, and Henry Barrowe, a lawyer. They called themselves Independents, but were also known as Brownists because of the separatist ideas of Cambridge-educated Robert Browne. 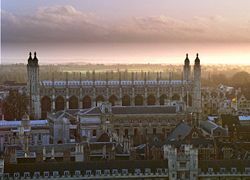 Cambridge University played an important role in advancing Puritan and separatist principles. Browne, Greenwood, Barrowe, and the future Pilgrim leader William Brewster were educated at Cambridge, as were other separatist leaders who would influence the theological, ecclesiastical, and political ideals of the Pilgrim Fathers. The atmosphere at Cambridge at this time was pro-Puritan and with a new spirit of reform. As a student Browne came under the influence of the Puritan theologian Professor Thomas Cartwright (1535-1603) and after a period of teaching returned to Cambridge and preached sermons that burned with criticism of the established church. His brother had obtained licenses to preach for both of them, but Robert had burnt his in protest. He came to reject the Church of England as unscriptural and also the Puritan view that the Church could be reformed from within. Browne set up a Separatist congregation with his college friend Robert Harrison in Norwich, but was imprisoned for unlicensed preaching after complaints from local priests. While in Norwich Browne probably came into contact with Dutch Anabaptists who reinforced his call for a new "true church ethic" that came to be known as Congregationalism. Due to persecution Browne and Harrison moved most of the congregation to Zealand in Holland in 1582, where Cartwright had already established a Puritan congregation. In Holland Browne and Harrison wrote a number of works advocating reform of the Church of England. The books were soon banned and burned in England, and several members of the Norwich congregation were hanged for selling them. Browne later traveled around England and Scotland preaching dissident views for which he was imprisoned many times, but because of family connections he was soon released each time. Browne ultimately reconciled with the established church, yet his writings were major contributions to the development of Elizabethan English religious dissent and the separatist movement. Many English dissidents would set sail for America and establish congregations along the lines of basic Brownist theology, which is why Browne has often been called the father of Congregationalism. Like Browne, Henry Barrowe (1550?-1593) studied at Cambridge under Thomas Cartwright, an expert on the Acts of the Apostles and history of the early Church. By profession a lawyer and from an old privileged family, Barrowe converted to strict Puritanism in 1580 after concluding that the Church of England had been tainted by Catholicism and was beyond any hope of redemption. Barrowe believed all their clergy and sacraments including infant baptism were invalid and rejected a church structure that placed layers of authority between the congregation and its ministers, as well as the use of written public services such as the Book of Common Prayer. In its place he advocated a New Testament–oriented service "to reduce all things and actions to the true ancient and primitive pattern of God's Word." With important implications for the Plymouth settlement and later Congregational church structure in colonial America, Barrowe believed that true religion could only exist in an ecclesiastical framework outside the control of the state or any other external church authority. All authority was to be given to each congregation to govern themselves as independent religious bodies. Ministers would not be appointed but elected by the membership of each individual congregation, and day-to-day management was delegated to its elected spiritual representatives: the pastor, elders, teachers, or deacons. In 1587 members of an illegal congregation of John Greenwood (1554-1593), a graduate of Cambridge and ordained at Lincoln in 1582, were discovered and imprisoned in the Clink by order of the Archbishop of Canterbury John Whitgift. Barrowe, a friend of Greenwood and whose name was on the congregation list, was also arrested. While in prison Greenwood and Barrowe continued to write and their publications were smuggled out of England to be published in Holland. Barrowe was charged with seditious writing, and held in prison. Meanwhile, in July 1592 Greenwood and other members were released on bail only to found a new separatist church, with yet another Cambridge graduate, Francis Johnson (1562-1618), elected as its pastor. (From a respected Yorkshire family, Johnson had previously been commissioned to assist local English authorities in Holland to buy and burn the books by Greenwood and Barrowe. But inspired by what he read, he embraced Barrowism and joining the church in Southwark in 1586.) However the reprieve was short-lived and in December Greenwood, Johnson, and others were again arrested. The church authorities examined Greenwood and Barrowe and sentenced them to death, and they were hung at Tyburn for sedition (a crime against the government), not heresy. The persecution of dissenters belied Elizabeth's expressions of moderation and famous affirmation that she didn't want to "make windows into men's souls." But suppression of dissent, including harsh imprisonment and execution, can be understood as a response to civil unrest as much as to religious intolerance. The church authorities seem to have been determined that the sentence would be carried out. However, four days later Queen Elizabeth I issued a statute allowing for the banishment of nonconformists instead of execution, although a third Cambridge separatist, John Penry (1563-1593), was executed in May. In 1597 members of Johnson's congregation were released from prison and encouraged by the authorities to leave the country. Some joined the other Barrowists who had fled to Holland in 1593, while others were sent them to Canada to establish an English colony on Rainea Island in the Saint Lawrence River. Four prominent Barrowist leaders set off on in April 1597, but ran into problems with French nationals and privateers and so eventually made their way to Holland to join the rest of the congregation. 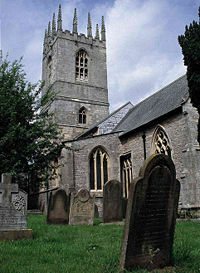 Another significant group of people who would formed the nucleus of the future Pilgrims were brought together through the teachings of Richard Clyfton, parson at All Saints' Parish Church in Babworth, Nottinghamshire, between 1586 and 1605. This congregation held Separatist beliefs similar to the nonconforming movements led by Barrowe and Browne. William Brewster, a former diplomatic assistant to the Netherlands, was living in the Scrooby manor house and serving as postmaster for the village and bailiff to the Archbishop of York. Brewster may have met the teenage William Bradford from nearby Austerfield on the so-called Pilgrim Way, a still-extant trail that led to the Babworth church. Orphaned and with little formal education, Bradford would later serve as governor of Plymouth Colony for nearly 40 years, author the historical chronicle Of Plimoth Plantation (the most important primary source of the Plymouth colony), and be remembered as the leading figure in seventeenth-century colonial American history. Having been favorably impressed by Clyfton's services, Brewster and Bradford began participating in Separatist services led by John Smyth, a Barrowist and friend of Johnson, in unincorporated (and thus largely unmonitored) Gainsborough, Lincolnshire.The lord of the ancient manor house, William Hickman, was an ardent Protestant whose family had survived the religious persecutions of Henry VIII. Sympathetic to the separatists, Hickman offered his protection and hosted the secret meetings. The All Saints Parish Church in Babworth, where William Bradford and William Brewster heard the separatist sermons of Richard Clyfton. The Puritans (whose phantasticall zeale I mislike) though they differ in Ceremonies & accidentes, yet they agree wth us in substance of religion, & I thinke all or the moste p[ar]te of them love his Ma[jes]tie, & the p[re]sente state, & I hope will yield to conformitie. But the Papistes are opposite & contrarie in very many substantiall pointes of religion, & cannot but wishe the Popes authoritie & popish religion to be established. It had been hoped that when James came to power, a reconciliation allowing independence would be possible, but the Hampton Court Conference of 1604 denied substantially all the concessions requested by Puritans, save for an English translation of the Bible. To the demand to abolish the episcopate James responded, "No Bishop, no King." Reform along Puritan lines could have unravelled the whole political system causing more instability at a time of continuing foreign threats. These important issues resurfaced later resulting in the English Civil War. Following the Conference, in 1605 Clyfton was declared a nonconformist and stripped of his position at Babworth. Brewster invited Clyfton to live at his home. Upon Hutton's 1606 death, Tobias Matthew was elected as his replacement. Matthew, one of James' chief supporters at the 1604 conference, promptly began a campaign to purge the archdiocese of nonconforming influences, both separatists and papists. Disobedient clergy were replaced, and prominent Separatists were confronted, fined, imprisoned, or driven out of the country. At about the same time, Brewster arranged for a congregation to meet privately at the Scrooby manor house. Beginning in 1606, services were held with Clyfton as pastor, John Robinson a graduate of Corpus Christi, Cambridge, as teacher, and Brewster as the presiding elder. Shortly thereafter, Smyth and members of the Gainsborough group moved on to Holland, first joining Johnson's congregation and later establishing his own congregation in Amsterdam in 1608. Unable to obtain the papers necessary to leave England, members of the congregation agreed to leave surreptitiously, resorting to bribery to obtain passage. One documented attempt was in 1607, following Brewster's resignation, when members of the congregation chartered a boat in Boston, Lincolnshire. This turned out to be a sting operation, with all arrested upon boarding. The entire party was jailed for one month awaiting arraignment, at which time all but seven were released. Missing from the record is for how long the remainder was held, but it is known that the leaders made it to Amsterdam about a year later. In a second departure attempt in the spring of 1608, arrangements were made with a Dutch merchant to pick up church members along the Humber estuary at Immingham near Grimsby, Lincolnshire. The men had boarded the ship, at which time the sailors spotted an armed contingent approaching. The ship quickly departed before the women and children could board; the stranded members were rounded up but then released without charges. Robinson decided that it would be best to remove his congregation from the fray, and permission to settle in Leiden was secured in 1609. With the congregation reconstituted as the English Exiled Church in Leyden, Robinson now became pastor while Clyfton, advanced in age, chose to stay behind in Amsterdam. The success of the congregation in Leiden was mixed. Leiden was a thriving industrial center, and many members were well able to support themselves working at Leiden University or in the textile, printing and brewing trades. Others were less able to bring in sufficient income, hampered by their rural backgrounds and the language barrier; for those, accommodations were made on an estate bought by Robinson and three partners. For these & some other reasons they removed to Leyden, a fair & bewtifull citie, and of a sweete situation, but made more famous by ye universitie wherwith it is adorned, in which of late had been so many learned man. But wanting that traffike by sea which Amerstdam injoyes, it was not so beneficiall for their outward means of living & estats. But being now hear pitchet they fell to such trads & imployments as they best could; valewing peace & their spirituall comforte above any other riches whatsoever. And at length they came to raise a competente & comforteable living, but with hard and continuall labor. Brewster had been teaching English at the university, and in 1615, Robinson enrolled to pursue his doctorate. There, he participated in a series of debates, particularly regarding the contentious issue of Calvinism versus Arminianism (siding with the Calvinists against the Remonstrants). Brewster, in a venture financed by Thomas Brewer, acquired typesetting equipment about 1616 and began publishing the debates through a local press. Holland was, however, a land whose culture and language were strange and difficult for the English congregation to understand or learn. Their children were becoming more and more Dutch as the years passed by. The congregation came to believe that they faced eventual extinction if they remained in Holland. They wanted to either return to England or move as free Englishmen to a new English homeland beyond the sea. By 1617, although the congregation was stable and relatively secure, there were ongoing issues that needed to be resolved. Bradford noted that the congregation was aging, compounding the difficulties some had in supporting themselves. Some, having spent their savings, gave up and returned to England. It was feared that more would follow and that the congregation would become unsustainable. The employment issues made it unattractive for others to come to Leiden, and younger members had begun leaving to find employment and adventure elsewhere. Also compelling was the possibility of missionary work, an opportunity that rarely arose in a Protestant stronghold. Reasons for departure are suggested by Bradford, when he notes the "discouragements" of the hard life they had in Holland, and the hope of attracting others by finding "a better, and easier place of living"; the "children" of the group being "drawn away by evil examples into extravagance and dangerous courses"; the "great hope, for the propagating and advancing the gospel of the kingdom of Christ in those remote parts of the world." Pilgrim Edward Winslow's recollections support Bradford's account: In addition to the economic worries and missionary possibilities, Winslow stressed that it was important for the people to retain their English identity, culture and language. They also believed that the English Church in Leiden could do little to benefit the larger community there. At the same time, there were many uncertainties about moving to such a place as America. Stories had come back about the failed Sagadahoc colony in today's Maine and of the hardships faced by the Jamestown settlement in Virginia. There were fears that the native people would be violent, that there would be no source of food or water, that exposure to unknown diseases was possible, and that travel by sea was always hazardous. Balancing all this was a local political situation that was in danger of becoming unstable: the truce in what would be known as the Eighty Years' War was faltering, and there was fear over what the attitudes of Spain toward them might be. Possible destinations included Guiana, where the Dutch had already established Essequibo; or somewhere near the existing Virginia settlement. Virginia was an attractive destination because the presence of the older colony might offer better security. It was thought, however, that they should not settle too near and thus fall into the same restrictive political environment as in England. The congregation decided to petition the English Crown for a charter to establish an English colony in the New World. Some were concerned about approaching the government of King James that had forced them into exile. However William Brewster had maintained the contacts he had developed during his period of service with William Davison, sometime Secretary of State under Queen Elizabeth. John Carver and Robert Cushman were dispatched to London to act as agents on behalf of the congregation. Their negotiations were delayed because of conflicts internal to the London Company, but eventually a patent was secured in the name of John Wincob on June 9, 1619. The charter was granted with the king's condition that the Leiden group's religion would not receive official recognition. Because of the continued problems within the London Company, preparations stalled. The congregation was approached by competing Dutch companies, and the possibility of settling in the Hudson River area was discussed with them. These negotiations were broken off at the encouragement of another English merchant, Thomas Weston, who assured the anxious group that he could resolve the London Company delays. Weston did come back with a substantial change, telling the Leiden group that parties in England had obtained a land grant north of the existing Virginia territory, to be called New England. This was only partially true; the new grant would come to pass, but not until late in 1620 when the Plymouth Council for New England received its charter. It was expected that this area could be fished profitably, and it was not under the control of the existing Virginia government. A second change was known only to parties in England who chose not to inform the larger group. New investors who had been brought into the venture wanted the terms altered so that at the end of the seven-year contract, half of the settled land and property would revert to them; and that the provision for each settler to have two days per week to work on personal business was dropped. Amid these negotiations, William Brewster found himself involved with religious unrest emerging in Scotland. In 1618, James had promulgated the Five Articles of Perth, which were seen in Scotland as an attempt to encroach on their Presbyterian tradition. Pamphlets critical of this law were published by Brewster and smuggled into Scotland by April 1619. These pamphlets were traced back to Leiden, and a failed attempt to apprehend Brewster was made in July when his presence in England became known. Also in July in Leiden, English ambassador Dudley Carleton became aware of the situation and began leaning on the Dutch government to extradite Brewster. Brewster's type was seized, but only the financier Thomas Brewer was in custody. Brewster's whereabouts between then and the colonists' departure remain unknown. After several months of delay, Brewer was sent to England for questioning, where he stonewalled government officials until well into 1620. One resulting concession that England did obtain from the Netherlands was a restriction on the press that would make such publications illegal to produce. 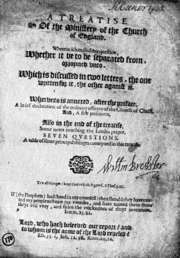 Brewster was ultimately convicted in England in absentia for his continued religious publication activities and sentenced in 1626 to a 14-year prison term. As many members were not be able to settle their affairs within the time constraints and the budget for travel and supplies was limited, it was decided that the initial settlement should be undertaken primarily by younger and stronger members. Accordingly, the decision was made for Robinson to remain in Leiden with the larger portion of the congregation, and Brewster to lead the American congregation. While the church in America would be run independently, it was agreed that membership would automatically be granted in either congregation to members who moved between the continents. With personal and business matters agreed upon, supplies and a small ship were procured. The Speedwell was to bring some passengers from the Netherlands to England, then on to America where the ship would be kept for the fishing business, with a crew hired for support services during the first year. A second, larger ship, the Mayflower, was leased for transport and exploration services. In July 1620 one hundred and twenty members of the Leyden Barrowist congregation under the spiritual leadership of William Brewster as Elder departed Delfshaven in the Speedwell for Plymouth. There they met the London Company representatives, and their sister ship the Mayflower that would transport the employees of the London Company to establish their trading post. When they arrived in Plymouth the Barrowists were welcomed by the local church. However before the ships set sail a number of disagreements occurred between the representatives of the London Company and the Leiden colonists. Some of the London Company representatives tried to make a profit off the colonists in Plymouth and many of the colonists had disagreements with the London Company employees on the Mayflower. The Mayflower and the Speedwell set sail from Plymouth on August 5, 1620. After a week problems developed on the Speedwell and they had to return to Dartmouth Harbor. After repairs they set sail again for America. Within a few days they had to return to Plymouth for additional repairs to the Speedwell. It was decided to abandon the Speedwell and put everyone on the London Company's ship the Mayflower. Of the 120 Speedwell passengers, 102 were chosen to travel on Mayflower with the supplies consolidated. The Mayflower set sail from Plymouth on September 16, 1620. Initially the trip went smoothly, but under way they were met with strong winds and storms. One of these caused a main beam to crack, and although they were more than half the way to their destination, the possibility of turning back was considered. Using a "great iron screw" they repaired the ship sufficiently to continue. One passenger, John Howland, was washed overboard in the storm but caught a rope and was rescued. One crew member and one passenger died before they reached land, and one child was born at sea, and named "Oceanus." Land was sighted on November 20, 1620. It was confirmed that the area was Cape Cod, within the New England territory recommended by Weston. 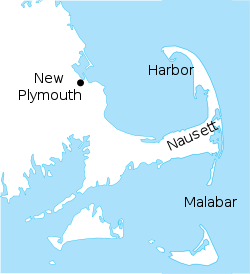 An attempt was made to sail the ship around the cape towards the Hudson River, also within the New England grant area, but they encountered shoals and difficult currents around Malabar (a land mass that formerly existed in the vicinity of present-day Monomoy). It was decided to turn around, and by November 21 the ship was anchored in what is today known as Provincetown Harbor. This bas-relief depicting the signing of the Mayflower Compact is on Bradford Street in Provincetown directly below the Pilgrim Monument. With the charter for the Plymouth Council for New England incomplete by the time the colonists departed England (it would be granted while they were in transit, on November 13), the Pilgrims arrived without a patent. Some of the passengers, aware of the situation, suggested that without a patent in place, they were free to do as they chose upon landing and ignore the contract with the investors. To address this issue and in response to certain "mutinous speeches," a brief contract, signed on November 11, 1620 on board the Mayflower, later to be known as the Mayflower Compact, was drafted promising cooperation among the settlers "for the general good of the Colony unto which we promise all due submission and obedience." The document was ratified by majority rule, with 41 adult male passengers signing. In the name of God, Amen. We whose names are underwritten, the loyal subjects of our dread Sovereign Lord King James, by the Grace of God of Great Britain, France and Ireland, King, Defender of the Faith, etc. Having undertaken, for the Glory of God and advancement of the Christian Faith and Honour of our King and Country, a Voyage to plant the First Colony in the Northern Parts of Virginia, do by these presents solemnly and mutually in the presence of God and one of another, Covenant and Combine ourselves together into a Civil Body Politic, for our better ordering and preservation and furtherance of the ends aforesaid; and by virtue hereof to enact, constitute and frame such just and equal Laws, Ordinances, Acts, Constitutions and Offices, from time to time, as shall be thought most meet and convenient for the general good of the Colony, unto which we promise all due submission and obedience. In witness whereof we have hereunder subscribed our names at Cape Cod, the 11th of November, in the year of the reign of our Sovereign Lord King James, of England, France and Ireland the eighteenth, and of Scotland the fifty-fourth. Anno Domini 1620. At this time, John Carver was chosen as the colony's first governor. Thorough exploration of the area were delayed for over two weeks because the shallop or pinnace (a smaller sailing vessel) they brought had been partially dismantled to fit aboard Mayflower and was further damaged in transit. Small parties did wade to the beach to fetch firewood and attend to long-deferred personal hygiene. While awaiting the shallop, exploratory parties led by Myles Standish—an English soldier the colonists had met while in Leiden—and Christopher Jones were undertaken. They encountered several old buildings, both European- and Native-built, and a few recently cultivated fields. An artificial mound was found near the dunes, which they partially uncovered and found to be a Native grave. Further along, a similar mound, more recently made, was found, and as the colonists feared they might otherwise starve, they ventured to remove some of the provisions which had been placed in the grave. Baskets of maize were found inside, some of which the colonists took and placed into an iron kettle they also found nearby, while they reburied the rest, intending to use the borrowed corn as seed for planting. They also found two of the Indian's houses covered with mats, and some of their implements in them; but the people had run away and could not be seen. They also found more corn, and beans of various colours. These they brought away, intending to give them full satisfaction (repayment) when they should meet with any of them, – as about six months afterwards they did. By December, most of the passengers and crew had become ill, coughing violently. Many were also suffering from the effects of scurvy. There had already been ice and snowfall, hampering exploration efforts. Explorations resumed on December 16. The shallop party—seven colonists from Leiden, three from London, and seven crew—headed down the cape and chose to land at the area inhabited by the Nauset people (roughly, present-day Brewster, Chatham, Eastham, Harwich, and Orleans, Massachusetts) where they saw some native people on the shore, who ran when the colonists approached. Inland they found more mounds, one containing acorns, which they exhumed and left, and more graves, which they decided not to dig. Remaining ashore overnight, they heard cries near the encampment. The following morning, they were met by native people who proceeded to shoot at them with arrows. The colonists retrieved their firearms and shot back, then chased the native people into the woods but did not find them. There was no more contact with native people for several months. The local people were already familiar with the English, who had intermittently visited the area for fishing and trade before Mayflower arrived. In the Cape Cod area, relations were poor following a visit several years earlier by Thomas Hunt. Hunt kidnapped 20 people from Patuxet (the place that would become New Plymouth) and another seven from Nausett, and he attempted to sell them as slaves in Europe. One of the Patuxet abductees was Squanto, who would become an ally of the Plymouth colony. The Pokanoket, who also lived nearby, had developed a particular dislike for the English after one group came in, captured numerous people, and shot them aboard their ship. There had by this time already been reciprocal killings at Martha's Vineyard and Cape Cod. 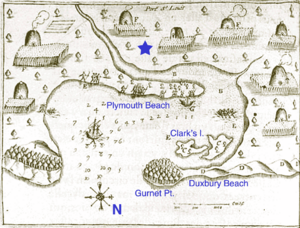 Samuel de Champlain's 1605 map of Plymouth Harbor, showing Wampanoag village Patuxet, with some modern place names added for reference. The star is the approximate location of the 1620 English settlement. Continuing westward, the shallop's mast and rudder were broken by storms, and their sail was lost. Rowing for safety, they encountered the harbor formed by the current Duxbury and Plymouth barrier beaches and stumbled on land in the darkness. They remained at this spot—Clark's Island—for two days to recuperate and repair equipment. Resuming exploration on December 21, the party crossed over to the mainland and surveyed the area that ultimately became the settlement. The anniversary of this survey is observed in Massachusetts as Forefathers' Day and is traditionally associated with the Plymouth Rock landing legend. This land was especially suited to winter building because the land had already been cleared, and the tall hills provided a good defensive position. The cleared village, known as Patuxet to the Wampanoag people, was abandoned about three years earlier following a plague that killed all of its residents. Because the disease involved hemorrhaging, the "Indian fever" is assumed to have been fulminating smallpox introduced by European traders. The outbreak had been severe enough that the colonists discovered unburied skeletons in abandoned dwellings. With the local population in such a weakened state, the colonists faced no resistance to settling there. The exploratory party returned to the Mayflower, which was then brought to the harbor on December 26. Only nearby sites were evaluated, with a hill in Plymouth (so named on earlier charts) chosen on December 29. Construction commenced immediately, with the first common house nearly completed by January 19. At this point, single men were ordered to join with families. Each extended family was assigned a plot and built its own dwelling. Supplies were brought ashore, and the settlement was mostly complete by early February. Between the landing and March, only 47 colonists had survived the diseases they contracted on the ship. During the worst of the sickness, only six or seven of the group were able and willing to feed and care for the rest. In this time, half the Mayflower crew also died. On March 16, 1621, the colonists were surprised when an Indian boldly entered the Plymouth settlement and greeted them in English. Samoset was a sagamore (subordinate chief) of an Abenaki tribe from Pemaquid, Maine, and had learned some English from the English fishermen that frequented Maine's coastal waters. After spending the night with the Pilgrims, he returned two days later with Squanto, who spoke English much better than Samoset and arranged for the Pilgrims to meet with the chief sachem of the Wampanoag, Massasoit. On March 22, 1621, the Pilgrims signed a peace treaty with Massasoit guaranteeing the English their security in exchange for their alliance against the Narragansett. Massasoit held the allegiance of seven lesser Wampanoag sachems and actively sought the alliance since two significant outbreaks of smallpox brought by the English had devastated the Wampanoag during the previous six years. An annual Thanksgiving after harvest became traditional in the seventeenth century. George Washington created the first Thanksgiving Day designated by the national government of the United States on October 3, 1789. The modern Thanksgiving holiday is often credited to Sarah Josepha Hale, editor of Boston's Ladies' Magazine. Beginning in 1827, she wrote editorials calling for a national, annual day of thanksgiving to commemorate the Pilgrim's first harvest feast. After nearly 40 years, in 1863, Abraham Lincoln declared the first modern Thanksgiving to fall on the last Thursday in November. President Franklin Roosevelt and Congress ultimately moved it to the fourth Thursday in November, and in 1941, the holiday was recognized by Congress as an official federal holiday. Massasoit smoking a peace pipe with Governor John Carver in Plymouth 1621. According to Bradford and other sources, Massasoit prevented the failure of Plymouth Colony and the almost certain starvation that the Pilgrims faced during the earliest years of the colony's establishment. Moreover, Massasoit forged critical political and personal ties with the colonial leaders John Carver, Stephen Hopkins , Edward Winslow, William Bradford, and Myles Standish. Massasoit's alliance ensured that the Wampanoag remained neutral during the Pequot War in 1636. Winslow maintained that Massasoit held a deep friendship and trust with the English and felt duty-bound to observe that "whilst I live I will never forget this kindness they have showed me." Unfortunately, the peaceful relationship that Massasoit had worked so diligently to create and protect had unforeseen dire consequences for the Wampanoag. In November 1621, one year after the Pilgrims first set foot in New England, a second ship sent by the Merchant Adventurers arrived. Named the Fortune, it arrived with 37 new settlers for Plymouth. However, as the ship had arrived unexpectedly, and also without many supplies, the additional settlers put a strain on the resources of the colony. Among the passengers of the Fortune were several additional members of the original Leiden congregation, including William Brewster's son Jonathan, Edward Winslow's brother John, and Philip de la Noye (the family name was later changed to "Delano") whose descendants include President Franklin Delano Roosevelt. The Fortune also carried a letter from the Merchant Adventurers chastising the colony for failure to return goods with the Mayflower that had been promised in return for their support. The Fortune began its return to England laden with ₤500 worth of goods, more than enough to keep the colonists on schedule for repayment of their debt, however the Fortune was captured by the French before she could deliver her cargo to England, creating an even larger deficit for the colony. In July 1623, two more ships arrived, carrying 90 new settlers, among them Leideners, including William Bradford's future wife, Alice. Some of the settlers were unprepared for frontier life and returned to England the next year. In September 1623, another ship carrying settlers destined to refound the failed colony at Weymouth arrived and temporarily stayed at Plymouth. In March 1624, a ship bearing a few additional settlers and the first cattle arrived. A 1627 division of cattle lists 156 colonists divided into twelve lots of thirteen colonists each. Another ship also named the Mayflower arrived in August 1629 with 35 additional members of the Leiden congregation. Ships arrived throughout the period between 1629 and 1630 carrying new settlers; though the exact number is unknown, contemporary documents claimed that by January 1630 the colony had almost 300 people. In 1643 the colony had an estimated 600 males fit for military service, implying a total population of about 2,000. By 1690, on the eve of the dissolution of the colony, the estimated total population of Plymouth County, the most populous, was 3,055 people. It is estimated that the entire population of the colony at the point of its dissolution was around 7,000. For comparison it is estimated that between 1630 and 1640, a period known as the Great Migration, over 20,000 settlers had arrived in Massachusetts Bay Colony alone, and by 1678 the English population of all of New England was estimated to be in the range of 60,000. Despite the fact that Plymouth was the first colony in the region, by the time of its absorption it was much smaller than Massachusetts Bay Colony. Based on the early friendship with the Plymouth colonists, for nearly 40 years the Wampanoag and the English Puritans of Massachusetts Bay Colony maintained an increasingly uneasy peace until Massasoit's death. Growing tensions between English colonists and Native Americans, who found their lands being lost and traditions being eroded, led to the decisive event of seventeenth-century English colonial history, the region-wide King Phillips War, 1675 to 1676. The war pitted English colonists and their numerous Indian allies against militant Indian tribes led by Massasoit's son, Metacomet, known to the English as "King Philip." The war killed nearly 7 of every 8 Indians and was proportionately one of the bloodiest and costliest in the history of America. The Plymouth colony contained roughly what now comprises Bristol, Plymouth, and Barnstable counties in Massachusetts. When the Massachusetts Bay Colony was reorganized and issued a new charter as the Province of Massachusetts Bay in 1691, Plymouth ended its history as a separate colony. The colonists at Jamestown and Plymouth faced similar hardships and demonstrated equal measures of fortitude, yet these earliest English settlements bequeathed differing legacies that shaped later colonial and U.S. history. In Jamestown, the cultivation of tobacco as the principal cash crop, the arrival of the first African slaves in 1619, and the emergence of an aristocratic planter class underscored the colony's commercial origins and contrasted with the more egalitarian and religiously devout ideals of the Plymouth colony. The Mayflower Compact, signed upon the ship's arrival on New England's shores, established the first fully representational government in America and upheld the principle of government by law with the consent of the people. The Plymouth community initiated consensus government that depended upon discussion and reason, which was emulated throughout New England through the forum of the town meeting. 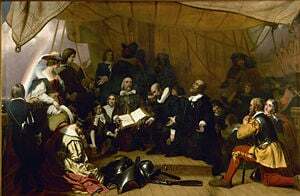 The Pilgrims’ experience of tolerance and accommodation in Holland would greatly influence their encounter with both Native Americans and dissenters. The colonists' fortuitous meeting with Samoset and Squanto, and their warm relations with the sachem Massasoit, led to a peace treaty with the Wampanoag that would endure for forty years. In contrast to the too-common pattern of European paternalism and mistreatment of native peoples, the Pilgrims respected the inhabitants who, Edward Winslow wrote, "considered themselves caretakers of this land […] owned by none, but held and used with respect by all." Unlike later Puritans, the Pilgrims did not engage in witch hunts or persecute dissenters. Following John Robinson's farewell injunction at Delfshaven—that "If God reveal anything to you by any other instrument of His, be as ready to receive it as you were to receive any truth from my ministry, for I am verily persuaded the Lord hath more truth and light yet to break forth from His holy word"—Plymouth would stand as the most liberal and tolerant religious community in the New World. William Bradford, like many of the Cambridge-educated separatists who upheld the principle of individual conscience, wrote: "It is too great arrogancy for any man or church to think that he or they have so sounded the word of God to the bottom as precisely to set down the church's discipline without error in substance or circumstance, as that no other without blame may digress or differ anything from the same. "Thus the nonconformist Roger Williams could spend more than two years at Plymouth as a teacher before returning to neighboring Massachusetts Bay, from whence he was soon exiled for spreading "diverse, new, and dangerous opinions." We have come to this Rock to record here our homage for our Pilgrim Fathers; our sympathy in their sufferings; our gratitude for their labours; our admiration of their virtues; our veneration for their piety; and our attachment to those principles of civil and religious liberty, which they encountered the dangers of the ocean, the storms of heaven, the violence of savages, disease, exile, and famine, to enjoy and establish. – And we would leave here, also, for the generations which are rising up rapidly to fill our places, some proof, that we have endeavored to transmit the great inheritance unimpaired; that in our estimate of public principles, and private virtue; in our veneration of religion and piety; in our devotion to civil and religious liberty; in our regard to whatever advances human knowledge, or improves human happiness, we are not altogether unworthy of our origin. ↑ Cornelius Brown, "Scrooby" A History of Nottinghamshire. (London: Elliot Stock, 1896). Nottshistory.org.uk. Retrieved June 18, 2007. ↑ Bradford, William, 1698 Of Plymouth Plantation. Bradford's History of Plymouth Plantation. (with English language updated) Retrieved September 12, 2008. ↑ William Elliot Griffis, "The Pilgrim Press in Leyden" New England Magazine 19 (25)(January 1899): 559-575  Cornell Univ. Retrieved September 12, 2008. ↑ Bradford, History, chapter 6. Bradford, William 1698 Of Plymouth Plantation. Bradford's History of Plymouth Plantation. (with English language updated) Retrieved September 12, 2008. Morrison, Samuel Eliot. The Oxford History of the American People. New York: Oxford University Press, 1965. Plymouth Plantation. Mourt's Relation, published in cooperation with Plimoth Plantation by Applewood Books, Bedford MA, Edited by Dwight B. Heath (from the original text of 1622), copyright 1963 by Dwight B. Heath, ISBN: 0918222842. This page was last modified on 28 March 2019, at 16:36.